Flu. With its ability to mutate and spread at lightning speed, a devastating global outbreak may be just a matter of time. And if that happens, it will begin with a single sick person. Beth Emhoff has a cough. Not a particularly loud or violent one. Just a cough. Nothing to worry about, right? Beth isn’t feeling so well. She’s the one who started coughing yesterday. And today, she’s doing more of it. Right now, she’s at Chicago’s O’Hare International Airport, awaiting her connecting flight from Hong Kong back to her home in Minneapolis. But before she arrives, she’ll dip her fingers into a bowl of peanuts. She’ll hand her credit card to the bartender. She’ll grip countless door handles, rails and other objects that will then be touched by other travelers. Those people will, on average, bring their hands to their faces 2,000 to 3,000 times a day. So for most of them, whatever microorganisms come in contact with their fingers will soon end up in their bodies. If any of those tiny bugs are viruses, their hosts may soon become carriers. Which would mean an ever-growing army spreading disease with every touch, breath, sneeze, kiss, cough, hug and handshake. She collapsed in her kitchen. Although paramedics rushed her to a nearby hospital, doctors were unable to save her. Truth be told, they don’t know what, exactly, caused a previously healthy woman in her late 30s to die suddenly. Perhaps an autopsy will tell more. But this type of flu is unlike any the world has seen before. It began when the virus jumped from an infected pig to a human. Unlike most other strains that have moved from animals to humans, though, this one passes easily from one human to another. And it carries a mortality rate of 25 to 30 percent. Fourteen million people are dead. Fortunately, Beth Emhoff isn’t real. She’s a character in Contagion, a 2011 film that imagined the rapid, worldwide spread of a deadly new virus. But the threat of a pandemic flu that claims millions of lives is no fiction. Thompson should know. With fellow OMRF immunologist Dr. Judith James, she’s spent the past six years heading a National Institutes of Health project studying influenza. The researchers’ specific focus is understanding why vaccines do not protect certain people from the flu. Like all flu researchers, Thompson is acutely aware of the pandemic virus that emerged in 1918, just as World War I was coming to a close. Scientists now believe this virus, dubbed Spanish flu, began in birds, but genetic changes enabled it to spread to humans. And when it jumped to people, the illness packed a deadly one-two punch. Not only was it highly contagious, but it carried a death rate of two percent. This may not sound like much, but it’s roughly 200 times more lethal than typical seasonal flu. Hard statistics are difficult to come by, but experts now estimate that by the time the 1918 outbreak came to an end, it had killed about 50 million people worldwide. In 2009, a highly contagious strain of influenza emerged from southeast Asia. While most new forms of influenza come from this region of the world, researchers were particularly worried because this virus initially originated in another species—pigs—which meant the human body’s immune system might lack the tools to form an effective response. 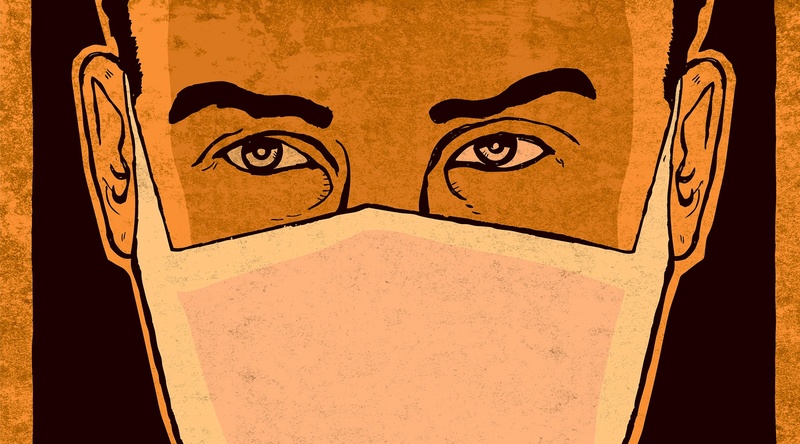 With easy transmissibility and potential lethality, the so-called swine flu seemed to possess the two key ingredients for a pandemic. So health authorities sprang to action. At OMRF, Thompson, James and Dr. Ken Smith assisted the U.S. Centers for Disease Control in Atlanta as CDC scientists scrambled to develop ways to diagnose, treat and prevent the virus. The OMRF researchers sent the CDC 67 antibodies they had produced against different strains of the flu. The hope was that the antibodies would bind to the newly emergent form of the virus, paving the way for the creation of rapid diagnostic tests and front-line therapeutics for health-care workers as they treated the sick. The CDC’s efforts paid off. Researchers succeeded in developing a vaccine that was produced in large quantities and administered in clinics, doctor’s offices, pharmacies and shopping malls around the country. But that process took the better part of a year. In the meantime the virus infected an estimated 50 million Americans. And while swine flu ultimately proved much less deadly than initially feared, killing only 1 in 2,000 people it infected, the virus nevertheless claimed 10,000 lives in the U.S. alone. Still, Thompson says, the outbreak taught valuable lessons. “This was a dress rehearsal. It set in motion an international collaboration to get the virus isolated and sequenced, to get that information disseminated, and to get a vaccine produced rapidly.” That infrastructure, she says, is still in place today. And it’s just waiting to kick into gear when the next potential strain of deadly pandemic flu emerges. Thompson and James’ laboratories are part of the global flu-fighting infrastructure. Teaming with Dr. Gillian Air at the University of Oklahoma Health Sciences Center, their research focuses on why people with compromised immune systems fail to make effective immune responses to flu. Specifically, they’ve studied a subcategory of immunocompromised individuals: patients with the disease lupus. “Although we’ve restricted our project to lupus patients, we hope that what we learn will have broader implications,” says James, who holds the Lou C. Kerr Chair in Biomedical Research at OMRF. Every fall for six years, the OMRF researchers immunized 30 lupus patients and 30 healthy people with the seasonal flu vaccine. They drew small amounts of blood from each group of volunteers at regular intervals—the day of immunization, then 2, 6 and 12 weeks later—and studied the samples to find out what happened in each group. Typically, immunization should trigger the production of antibodies and T cells, two of the body’s disease fighters. James and Thompson found that the lupus patients who were vaccinated produced normal amounts of both. But the quality of the antibodies paled in comparison to those of the healthy subjects. James and Thompson published a number of scientific papers that detailed these and other findings they made. For example, the researchers identified certain sub-groups of lupus patients who responded just as well as healthy people to vaccinations. They also found other sub-groups who made poor responses and were much more likely to experience adverse reactions. One of their most intriguing findings involved swine flu. In a small sub-study, the researchers administered a seasonal flu vaccine, which did not contain swine flu strains, to 10 healthy people. As expected, all of those who received the vaccine produced antibodies to the strains of flu contained in the vaccine. But half of those who received the shot also made antibodies to swine flu. “It was a small test group, but the results were clear: Even if a new strain of virus comes along, the regular vaccine may provide some protection,” says Thompson. Going forward, the OMRF researchers still have many questions they’d like to answer. Chief among them, says James, is “How can we take somebody who usually makes a bad response to the flu vaccine and turn that person into a good responder?” They’re also exploring ways to harness a technology developed at OMRF to produce antibodies that could protect first responders in the event of a newly emergent strain of the virus. Although the antibodies would not provide permanent protection, they could be used to temporarily bolster the immune systems of nurses, doctors and other health-care workers, allowing them to attend to the sick without risk of infection. This could help buy researchers crucial time to develop a vaccine that could be widely distributed. Still, that process could take as long as a year. In the meantime, millions could die. After all, viruses constantly evolve. The task for researchers like James and Thompson is to keep up with those changes—and to anticipate the next mutation, whatever it may be. The end of 2011 and the first months of 2012 passed without significant upticks in seasonal flu activity. With each quiet week, the chance for a pandemic dropped. At least for another year, Contagion was just a movie.